The IMH held a strongly supported inaugural Research Day this month – and such was its success that a follow-up event will be held next year. The event showcased and celebrated the work of IMH-related early-career researchers (including research assistants and research fellows), doctoral students and the IMH Managed Innovation Networks, attracting a maximum capacity of 70 delegates. Poster and oral presentations were given by 30 individuals with three plenary sessions from Prof. Nick Manning, Mat Kinton, and Dr John Milton. The two presentation prizes were awarded to Bethan Davies and Bridget Roe. Dr Melanie Jordan and Prof. Peter Bartlett, who chaired the event, are pleased to report that the event was well received by delegates in their evaluation feedback: “Excellent way to catch up on latest research and network. Please run again. Wish I could have been in both parallel sessions” and “Very beneficial and useful. Excellent ‘holding environment’ for researchers. Motivated to continue my work”. Jenelle Clarke’s reflection: “The IMH Research Day provided an excellent opportunity for researches to come together to share their work and gain valuable feedback on their research. It was especially useful hearing innovative approaches to mental health and understanding the challenges currently facing the field. The day also highlighted the diverse range of topics that IMH researchers are involved in. Dr John Milton concluded the day by reminding us all that research should be beneficial and have a real impact within mental health, particularly to those working to deliver services. To this end, assessing impact and increasing dissemination should be key considerations of research practice”. Fiona Birkbeck – The Cry for Professional Intimacy: Healing and learning in the 21st century. Changing client/expert relationships in our post-industrial public services. So, what are you researching? ‘ is the perennial question. My background in health was as Head of Rehabilitation Education for Long Term Patients for a Mental Health Trust. Sounds impressive. In reality, I was head of a demoralized and paranoid team of teachers, who suspected (rightly, as it turned out) that they would be made redundant by ‘Care in the Community’. We met our clients in classrooms which were in the basement of a vast, decaying Victorian mental health hospital. I started work there when my son was eight weeks old. They were desperate for me to get into post, even for the few hours I could offer at that time, but it was an overly ambitious undertaking and on my first day I was, of course, late. On rushing up the steps, not knowing where ‘my’ basement was, I breathlessly grabbed the first chap in a white coat that I saw. ‘Where is the basement. I have to get to the basement,’ I gasped, clutching his arm. Finally we found someone who knew who I was and why I was there. Bob relaxed. Then the penny clicked. ‘You thought I was a patient!’ I cried. He indicated my appearance. I looked in the mirror beside the stairs. There was a strange white patch of baby sick on my shoulder and my hair was sticking up. Who combs their hair when the baby’s hungry? I explained. Bob was a Glaswegian, and in one fell swoop of colloquialism, he had wiped out DSM 3, 4 and probably 5. A bit ‘mental’. Fair enough. I thought of Bob a few years ago when I began to carry out workshops developing resilience for practitioners working in Health and Education. They often told me that they felt under increasing pressure at work. They felt a bit, well, ‘mental’. My research question is to find out why. The relationship between the ‘client’ i.e. the patient, the pupil and the ‘expert practitioner’ i.e. the GP, the senior nurse, the hospital consultant, the teacher is changing in our post industrial public services. The outdated ‘one size fits all’, industrial model NHS and Education services fail to provide the individualized, relationship-led ‘healing’ and ‘learning that we all want. Social policy and government directives ask for each pupil, each patient to be treated as unique. Each pupil, each patient wants to feel that they are known and understood by their teachers and carers. The senior practitioners who have contributed to my research all want to design and provide an excellent service to society. They all recognize that to do it three things are needed: an increase of ‘emotional labour’ amongst practitioners (Hochschild 1983); training and support in what is called ‘deep care’ (Persaud 2004) and, above all, the time to offer this ’deep care’. They go on to say that we may want this kind of relationship with our practitioners, but we are not providing the structure to allow it. How can practitioners deliver 21st century professional intimacy in a 20th century structure? We have 30:1 teacher pupil ratio in our schools; an 8:1 patient/nurse ratio in our hospitals; GPs have 10 minutes for a consultation and, on nights, 1 junior doctor may be covering three hospital wards. My participants, all senior practitioners in our public services, indicated that they recognized this mismatch between the expectations and the reality of delivery as the cause of an alarming increase in stress related illness amongst teachers, doctors and hospital nurses. 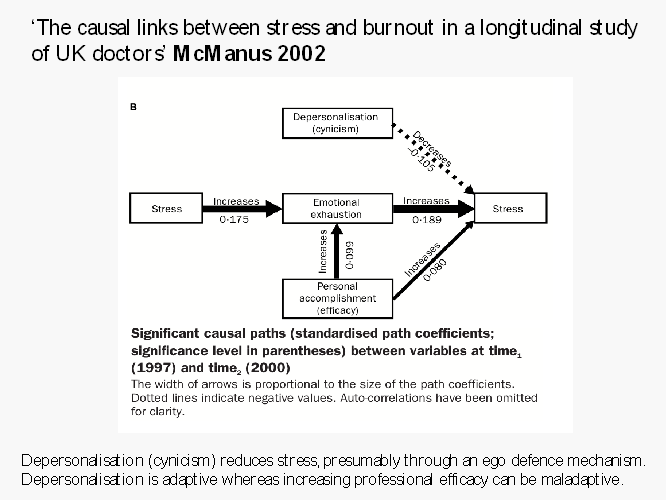 This longitudinal study of over 300 doctors by McManus et al describes a possible causal model for the increase in stress related illness in our ‘healers’ and ‘teachers’. McManus (2002) discusses the concept of ‘depersonalisation’. He is indicating the uncaring practitioner, too tired to be interested in their clients as individuals. He suggests that the practitioners who are under stress but who then are driven by a sense of professional responsibility to become more efficacious may simply increase their stress, and eventually they may burnout. The practitioner who does not increase their involvement with the patient, or the pupil, survives. Thus, ‘depersonalization’, which we might describe as cynicism or callousness, is adaptive whilst increasing professional efficacy is maladaptive. And we, the clients, get the very practitioners we don’t want. We get the ‘uncaring’ nurse, the ‘uninterested’ doctor and the ‘weak’, ‘uninspiring’ teacher. These undesirable practitioners do exist. They are not a figment of the media’s imagination. But we must examine the possibility described by McManus (2002) that shocking incidents of ‘unprofessional’ behavior are the product of a system which is, in some situations, unworkable and not always caused by an alarming increase in the employment of unsuitable staff. The policy makers certainly point to the unsuitable individual as the root cause of the problem in the delivery of our services. 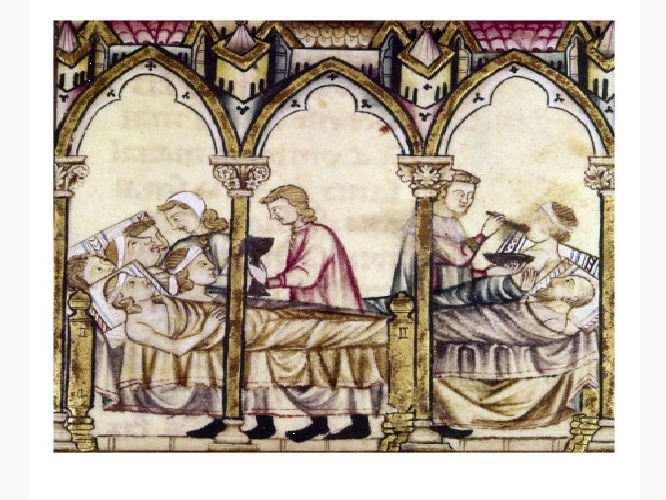 We have the introduction of psychometric testing for teachers in 2012 as a way of sifting out those who lack the emotional intelligence to be teachers (Smithers 2011); we have the introduction of ‘role play’ in the induction of medical students (Report. GMC 2012), in order to find those with the ‘empathy’ needed. Our trainee nurses are to spend a year working as HCAs to ensure that they have the necessary caring attitude (Denis Campbell, The Guardian. March 2013). Of course, we all want teachers with ‘emotional intelligence’, doctors who are ‘empathetic’ and nurse who ‘care’. In the 21st century, we are increasingly needful of being offered ‘professional intimacy’ from our practitioners. Head teachers, GPs, hospital consultants and senior nurses have told me that prospective staff come to work in Health and Education precisely because they have those qualities, as they always have done. But they have also told me that if the system is not redesigned to allow those qualities to be nurtured then we will continue to lose good practitioners from our services and the cry for ‘professional intimacy’ will become a wail. Hochschild, A. R. 1983. The Managed Heart: Commercialization of Human Feeling. Los Angeles, California, United States of America: University of California Press. PATTANI S, Constantinovici N.,Williams S., Who retires early from the NHS because of ill health and what does it cost? A national cross-sectional study. BMJ. 2001; 322: 208–9. The following article, How Austerity Kills, by David Stuckler and Sanjay Basu, was originally published in The New York Times on 12 May 2013. Because the Italian government’s austerity budget had raised the retirement age, Mr. Dionisi, a former construction worker, became one of Italy’s esodati (exiled ones) – older workers plunged into poverty without a safety net. On April 5, he and his wife left a note on a neighbor’s car asking for forgiveness, then hanged themselves in a storage closet at home. When Ms. Sopranzi’s brother, Giuseppe Sopranzi, 73, heard the news, he drowned himself in the Adriatic. In the United States, the suicide rate, which had slowly risen since 2000, jumped during and after the 2007-9 recession. In a new book, we estimate that 4,750 “excess” suicides – that is, deaths above what pre-existing trends would predict – occurred from 2007 to 2010. Rates of such suicides were significantly greater in the states that experienced the greatest job losses. Deaths from suicide overtook deaths from car crashes in 2009. As scholars of public health and political economy, we have watched aghast as politicians endlessly debate debts and deficits with little regard for the human costs of their decisions. Over the past decade, we mined huge data sets from across the globe to understand how economic shocks – from the Great Depression to the end of the Soviet Union to the Asian financial crisis to the Great Recession – affect our health. What we’ve found is that people do not inevitably get sick or die because the economy has faltered. Fiscal policy, it turns out, can be a matter of life or death. At one extreme is Greece, which is in the middle of a public health disaster. The national health budget has been cut by 40 percent since 2008, partly to meet deficit-reduction targets set by the so-called troika – the International Monetary Fund, the European Commission and the European Central Bank – as part of a 2010 austerity package. Some 35,000 doctors, nurses and other health workers have lost their jobs. Hospital admissions have soared after Greeks avoided getting routine and preventive treatment because of long wait times and rising drug costs. Infant mortality rose by 40 percent. New H.I.V. infections more than doubled, a result of rising intravenous drug use – as the budget for needle-exchange programs was cut. After mosquito-spraying programs were slashed in southern Greece, malaria cases were reported in significant numbers for the first time since the early 1970s. Somewhere between these extremes is the United States. Initially, the 2009 stimulus package shored up the safety net. But there are warning signs – beyond the higher suicide rate – that health trends are worsening. Prescriptions for antidepressants have soared. Three-quarters of a million people (particularly out-of-work young men) have turned to binge drinking. Over five million Americans lost access to health care in the recession because they lost their jobs (and either could not afford to extend their insurance under the Cobra law or exhausted their eligibility). Preventive medical visits dropped as people delayed medical care and ended up in emergency rooms. (President Obama’s health care law expands coverage, but only gradually.) The $85 billion “sequester” that began on March 1 will cut nutrition subsidies for approximately 600,000 pregnant women, newborns and infants by year’s end. Public housing budgets will be cut by nearly $2 billion this year, even while 1.4 million homes are in foreclosure. Even the budget of the Centers for Disease Control and Prevention, the nation’s main defense against epidemics like last year’s fungal meningitis outbreak, is being cut, by at least $18 million. To test our hypothesis that austerity is deadly, we’ve analyzed data from other regions and eras. After the Soviet Union dissolved, in 1991, Russia’s economy collapsed. Poverty soared and life expectancy dropped, particularly among young, working-age men. But this did not occur everywhere in the former Soviet sphere. Russia, Kazakhstan and the Baltic States (Estonia, Latvia and Lithuania) – which adopted economic “shock therapy” programs advocated by economists like Jeffrey D. Sachs and Lawrence H. Summers – experienced the worst rises in suicides, heart attacks and alcohol-related deaths. Like the fall of the Soviet Union, the 1997 Asian financial crisis offers case studies – in effect, a natural experiment – worth examining. Thailand and Indonesia, which submitted to harsh austerity plans imposed by the I.M.F., experienced mass hunger and sharp increases in deaths from infectious disease, while Malaysia, which resisted the I.M.F.’s advice, maintained the health of its citizens. In 2012, the I.M.F. formally apologized for its handling of the crisis, estimating that the damage from its recommendations may have been three times greater than previously assumed. America’s experience of the Depression is also instructive. During the Depression, mortality rates in the United States fell by about 10 percent. The suicide rate actually soared between 1929, when the stock market crashed, and 1932, when Franklin D. Roosevelt was elected president. But the increase in suicides was more than offset by the “epidemiological transition” – improvements in hygiene that reduced deaths from infectious diseases like tuberculosis, pneumonia and influenza – and by a sharp drop in fatal traffic accidents, as Americans could not afford to drive. Comparing historical data across states, we estimate that every $100 in New Deal spending per capita was associated with a decline in pneumonia deaths of 18 per 100,000 people; a reduction in infant deaths of 18 per 1,000 live births; and a drop in suicides of 4 per 100,000 people. One need not be an economic ideologue – we certainly aren’t – to recognize that the price of austerity can be calculated in human lives. We are not exonerating poor policy decisions of the past or calling for universal debt forgiveness. It’s up to policy makers in America and Europe to figure out the right mix of fiscal and monetary policy. What we have found is that austerity – severe, immediate, indiscriminate cuts to social and health spending – is not only self-defeating, but fatal. Professor Nikolas Rose will be giving a public lecture on 15 May 2013 at 4:30pm entitled, ‘What is ‘Mental Illness Today? Five Hard Questions’. This talk is part of the School of Sociology and Social Policy’s Seminar Series and will be held in B63 in the Law and Social Sciences Building, University of Nottingham Main Campus. All are welcome and entrance is free, but please contact michelle.fusco@nottingham.ac.uk to ensure a place. Parking is unregulated from 4.00pm and light refreshments will be available afterwards. An innovative project, which has brought together ethnographic researchers with theatre practitioners to tackle the challenge of dementia care, has led to the development of a play, soon to run at the Lakeside Arts Theatre. 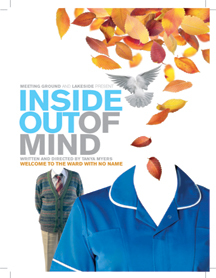 The play, Inside Out of Mind, brilliantly illustrates the multiple realities of life on a dementia ward, and is a unique collaboration between Meeting Ground Theatre Company, Lakeside Arts Centre at the University of Nottingham, the Institute of Mental Health (IMH) and the NHS. The play, written by Tanya Myers, is based on extensive and rigorous participant observation in dementia wards by researchers Simon Bailey, Kezia Scales and Joanne Lloyd, and has taken three years to evolve into a theatre production from the original research. Inside Out of Mind shows the dementia ward from the perspective of the patients, staff and visitors, and aims to impact positively on the care of those with dementia, and to encourage empathy and intuitive listening. Shona Powell, Director of Lakeside Arts Centre said: “Lakeside is delighted to be a key partner in the realisation of this exciting project. It’s the first time we’ve worked with colleagues in the Institute of Mental Health to platform the outcomes of academic research through theatre and we’re excited about the enormous potential this play has to reach new audiences and to make a real and lasting impact in the care sector”. To book, please visit the Lakeside Arts Theatre website. The Influencing Machine with author, historian, and curator Mike Jay. Mike Jay will discuss the case of James Tilly Matthews, an “incurable lunatic” confined to Bedlam in 1797. Matthews insisted his mind was being controlled by a machine. He is regarded as the first person to present clear symptoms of paranoid schizophrenia, and the Air Loom was an example of paranoid delusion now known as “the influencing machine”. Public Servant re-post: “Health check on Thatcher’s legacy”. “The health of the nation has improved since Margaret Thatcher first walked through the door of 10 Downing Street, say Professors Brian Brown and Paul Crawford, but time has thrown up new challenges”.